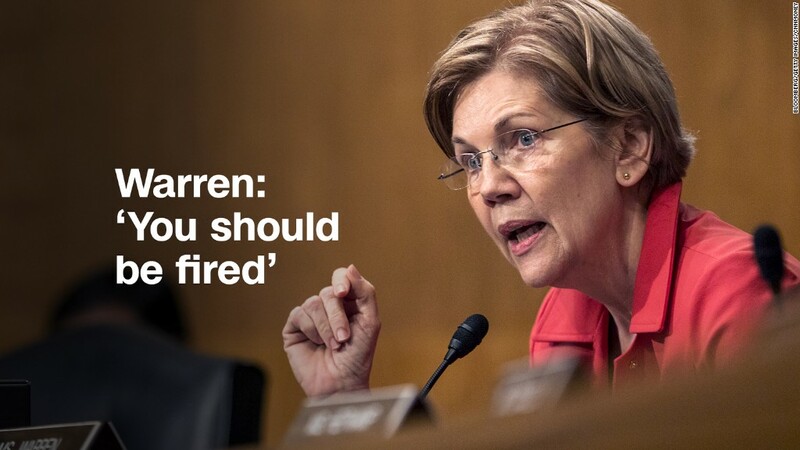 Senator Elizabeth Warren accused Wells Fargo CEO Tim Sloan of trying to cover up the bank's creation of millions of phony accounts and said he deserves to get fired. "You enabled this fake-account scandal. You got rich off it, and then you tried to cover it up," Warren said during a fiery exchange Tuesday at a hearing of the Senate Banking Committee. Wells Fargo has uncovered at least 3.5 million potentially fake accounts, which the bank has blamed on a corrupt culture hungry for sales. Sloan was installed a year ago after CEO John Stumpf was ousted over the scandal. The bank has since admitted to forcing hundreds of thousands of customers into car insurance they didn't need. At the hearing, lawmakers from both parties condemned Wells Fargo for repeatedly ripping off customers. Warren, a Democrat from Massachusetts, said she has no faith that Sloan, a 30-year veteran of the bank, is the right person to fix things. Sloan acknowledged to Congress that bank management failed to take decisive action to head off the scandal that has rocked the bank for the past year. "We recognized too late the full scope and seriousness of the problems," Sloan told lawmakers. He called it "a year of disappointment and transition at Wells Fargo," and insisted he's forced fundamental changes to fix the bank's rotten culture. But he was slammed by Republicans, too. Senator John Kennedy of Louisiana said to Sloan: "What in God's name were you thinking?" Kennedy emphasized he's not anti-business. "I'm not against big. With all due respect, I'm against dumb." Senator Sherrod Brown, the top Democrat on the committee, accused Wells Fargo of going to "great lengths to bury -- to bury -- this scandal" by using forced arbitration clauses to prevent customers from suing. And Senator Brian Schatz, a Hawaii Democrat, suggested that regulators should consider revoking the bank's charter and shutting it down entirely. Sloan emphasized that Wells Fargo provides services to one in three American households and employs 271,000 workers. "So you're too big?" Schatz asked. Sloan insisted Wells Fargo "isn't too big at all" and has tried to fix its mistakes. Earlier in the hearing, he seemed to place some blame on his predecessor, Stumpf. "The bank's leaders acted too slowly and too incrementally. That was unacceptable," Sloan said. Wells Fargo (WFC) is being hauled back before Congress almost exactly a year after the bank's first hearing on the fake account scandal. Since then, Wells Fargo has admitted to even deeper problems. Wells Fargo hoped Tuesday's hearing would go better than last year's. During that hearing, Stumpf was berated by lawmakers, most memorably during a fiery exchange with Warren. He stepped down three weeks later. "We came to Congress without a good plan and all of you were right to criticize us," Sloan said. He explained that when Stumpf testified last year, Wells Fargo "had not fully grappled with the damage" the scandal did to its customers and employees. Related: Should Wells Fargo be shut down entirely? Wells Fargo is trying to put out the firestorm by detailing the many steps the bank has taken to fix its broken sales culture. Sloan emphasized that Wells Fargo has held its former leaders accountable, revamped unrealistic sales goals, reached a $142 million class action settlement with customers and agreed to dig deeper into its problems. A company-wide review of Wells Fargo's sales tactics and interactions with customers has resulted in more bad news. Wells Fargo recently uncovered up to 1.4 million more potentially unauthorized accounts. The bank also admitted to forcing up to 570,000 borrowers into unneeded auto insurance, including thousands whose cars were wrongly repossessed. "I am deeply sorry for letting down our customers and team members. I apologize for the damage done to all the people who work and bank at this important American institution," Sloan said. Wells Fargo has also been accused of firing whistleblowers who spoke up about the fake account problem. Sloan said Wells Fargo has improved its ethics protections to encourage employees to "speak up without any fear of retaliation." Still, some lawmakers are fed up. Warren has urged the Federal Reserve to remove most of Wells Fargo's board for failing to provide adequate oversight. And the bank is still under investigation, including by the Department of Justice, the Securities and Exchange Commission and the Labor Department. "The past year has been humbling and challenging," Sloan said. "We are resolving past problems even as we make changes to ensure nothing like this happens again at Wells Fargo."